Patsy Dunne, MCC (RIP), Canon Cryan (RIP), Jim Keigher, Martin Murphy(RIP), Tommy Moffitt MRCVS (RIP), James O’Donoghue, Tommy Phillips (RIP) and Pat Phillips (RIP). John Durcan and Tommy Fleming, Hagfield (Dug out the earth) Frank Harrington (carried away the soil), Peter Donnellan (measurements and site preparation) assisted by Pake Duffy, Pat Brennan and Tom Durcan (all RIP). Dominick Jordan helped with construction of the dressing rooms. The pool measured 66’ x 29’ with a 3’ shallow end and 5’ deep end. The pool was very well planned with a skimmer system to aid with filtration. The committee organised many successful fundraising events including an annual Gymkhana that started in 1968, a parachute jump and annual swimming galas. 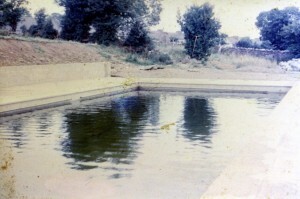 Over the years, numerous people from the area were involved in the ongoing running and fundraising for the swimming pool. Names on the record include: Very Rev. Canon Gallagher (RIP), Rev Fr. Farrell Cawley, Bridie Feehily, Sean Grimes, John M. Flannery, Matt Finn, Margo Kenny, Teresa Gavaghan, Angie Casey, Noel Morrisroe, Gerry Murracy, MCC, Caroline Peyton, Geraldine Finn, Helena Finn, the ‘Busy Lizzies’ local group, Charlestown Foroige Club and especially Marcus Craig (RIP) who painted a wonderful mural on the dressing room walls that was admired for many years. Check out the Youtube video below of Charlestown in 1968 which shows a clip of the swimming pool! In July 1971, over 200 children from Charlestown, Swinford, Curry and Tubbercurry areas participated in swimming and lifesaving lessons under the guidance of Ms. Terry Sherry, P.E. Foxford. Lessons continued for two weeks every summer and included lessons for adults and children as Charlestown Swimming Pool turned out many swimmers, lifeguards and Swim Instructors in the years to come. Those of us who learned to swim in Charlestown Pool are so grateful for the opportunity to learn and for the many great hours and summers we enjoyed at the pool. The Annual Swimming Gala was always an enjoyable event at Charlestown Swimming Pool and a number of our swimmers successfully represented the town at galas in Claremorris. Over the years, the committee continued to fundraise and were always grateful for grant aid provided from Mayo County Council. In 2005, Clár, Mayo County Council and Mayo North East Leader together with funds from the swimming pool provided much needed funding for the construction of new dressing rooms, shower facilities, administration area and equipment rooms. Noel Morrisroe, Gerry Murray, Margot Kenny, Helena Finn, Geraldine Finn and Caroline Peyton were instrumental in the successful completion of the new facilities. Local businesses were involved in the construction of the pool and once again Charlestown was fortunate to have volunteers assist in whatever way possible (Aiden Horkan, Micheál Beirne, Anthony O’Reilly and Martin Doherty). The People of Charlestown have always been very passionate about the excellent facility we have had on our doorstep for over 40 years. Over the years, many people have been involved in the ongoing upkeep and running of the pool. The existing committee are very grateful for the dedication of past committees that have continued to provide a much needed facility on our doorstep. We look forward to reaching out to past members to gather more information about Charlestown Swimming Pool events so we can share them with you. Many thanks to Cathal Henry for researching the history of the pool….